This is my Mom’s recipe and is different in flavor and taste as only Beans is used; ofcourse many varieties of Beans. She makes this along with Vegetable Kurma and Onion Raita. Mixed Beans ¾ cup (200ml cup); I used Peas, Red Kidney Beans(Rajma) and Mochai Kottai (Seeds of Indian/Hyacinth Beans). Soak Red Kidney Beans for 5-6 hrs and pressure cook them for 1-2 whistles. Soak Basmati Rice for 20-30 minutes. Puree the Tomato. Chop Onions lengthwise. Slit Chillies. Heat Butter and Oil in a Cooker. Add whole Garam Masala. When Aniseeds crackle and others turn slightly brown, add Pudina & Coriander Leaves, Chillies, Ginger-Garlic Paste and Onions. Fry till they are slightly brown. Now add Tomato Paste and all the Powders. Mix well and fry till the oil separates. Now add all the Beans along with Rajma. Saute for a while. Now add Water and Salt. Cook for one whistle. Serve with Vegetable Kurma and Raita. Notes: You can also add Double Beans and Butter Beans like my Mom. When fresh Beans is used, the taste of the Rice is very much better. Sending this recipe to Signature Recipes of Saras’ Kitchen, Sobha Shyam’s Proteinicious Event and to Iftar Moments of Taste of Pearl City. Thx Vimitha for your super fast comment.. Comforting & nutritious recipe.. Thanks for sending your entry to my event dear..
lovely recipes with proteins. I like with raitha. 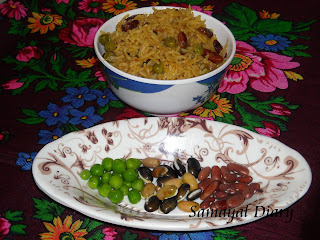 nice recipe with mixed beans- good looking rice ! This is tasty and healthy. wow, lovely rice, very healthy n delicious, thanx for linking it to my event!! Very delicious and healthy too. I like the spices in it. 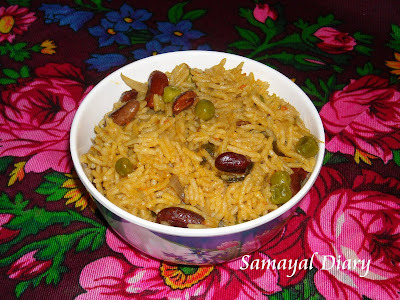 Aromatic food.. Looks tempting..
Nice recipe,should be very healthy too! Great combo and looks very tasty! Regarding the idli, yes we grind dal and rice separately for regular idli, but for Kanchipuram idli we want it to be coarse and so we grind it together.